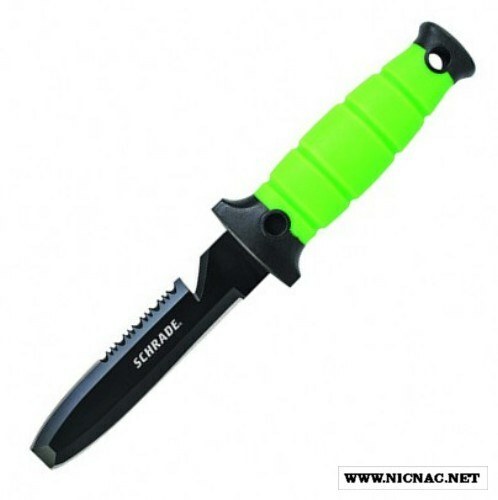 Schrade WR3 Water Rat Dive Fixed Blade Knife, overall length is 9.50 inches with a blade length of 4.75 inches. The cutting edge is 4.25 inches. The blade material is 7Cr17MoV high carbon stainless steel with a Blunt Tip for prying clams and oysters from their beds and this dive knife comes with a Molded Polymer Sheath. The Shrade Water Rat Fixed Blade Knife has a green rubber handle with a hollow grind blade and is made in China.